I'm not sure if this post might be interpreted as being in poor taste following on closely from a real death, but here goes. It's just that an incident that actually occurred yesterday has caused me to reflect on the risk of different transport modes, again. I was cycling from Edgware to Willesden Sports Centre yesterday evening, when, almost there, I came across a police cordon preventing access to Harlesden Road. Both road and pavement were cordoned off. 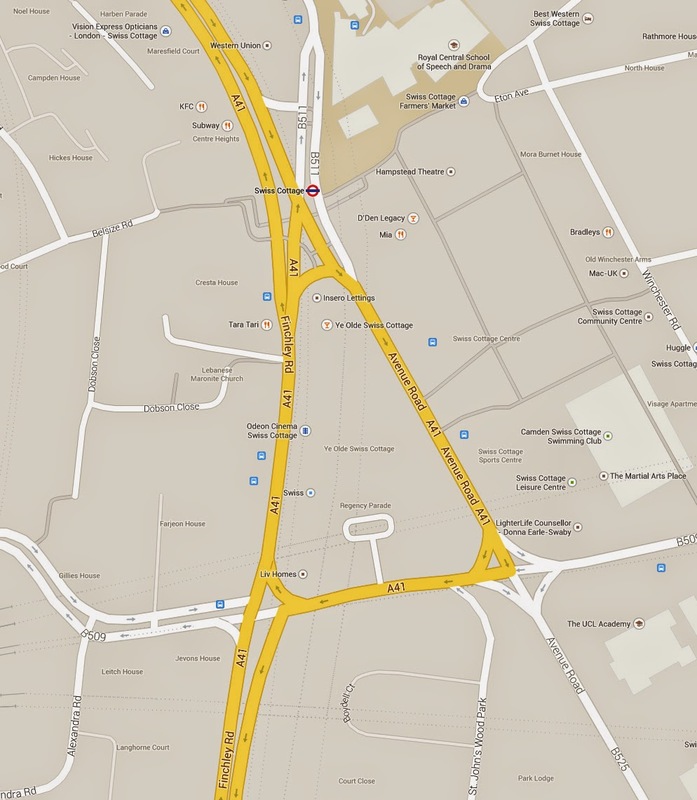 I managed to get through to Donnington Road by going round via the southern part of Harlesden Road. This was cordoned as well, but not across the pavement, so I wheeled my bike, and a policeman acknowledged me. I could see that a part of a tree had broken off and hit the bus stop in Harlesden Road near the Donnington Road junction. When I went back at 9:45pm, all was clear again and the tree was removed. I learn from the Brent and Kilburn Times and Evening Standard today that a 57-year old woman was killed by the tree, and a man was seriously injured. Both were waiting at the bus stop. 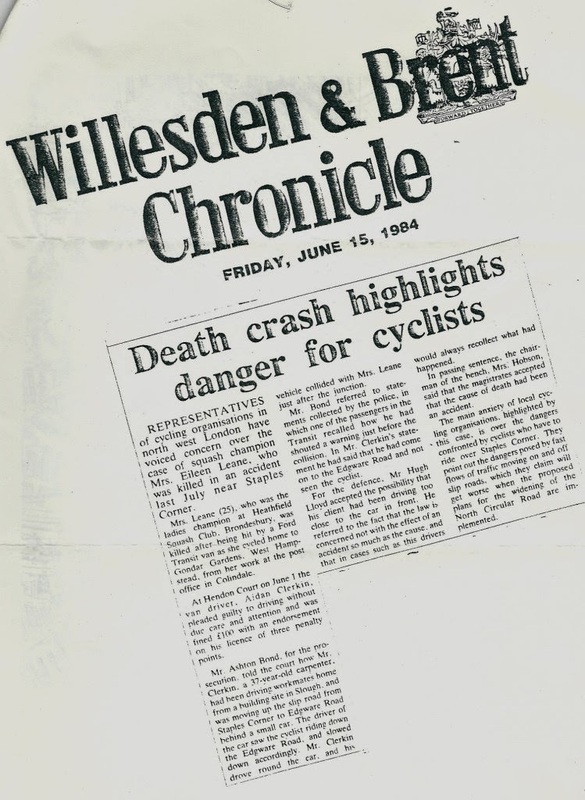 The last cycling death in Brent that I know of was in 2008. So at least as many people have been killed in Brent waiting for buses as have been killed cycling in six years. There is risk of death in all transport modes. However, I don't think this latest incident will cause many people to stop using buses in Brent. It will lead to calls for better safety inspections of trees, probably, and that would be sensible, though clearly risk due to falling trees will never be eliminated. 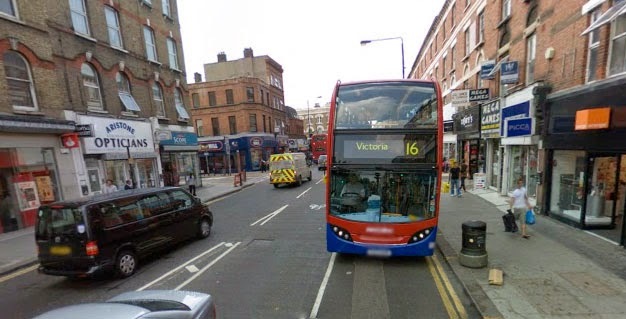 The risks associated with using buses, waiting for them, and walking on the pavements are randomised in such a way that no-one in good mental health is going to seriously worry about them, and be put off from those activities by statistics associated with them. If you have a concept of "Acts of God", then this fatal incident is close to that. It might have been preventable, but not obviously so. The risks around cycling are totally different. They are far more predictable and they are connected, by and large, with the design of the roads. This is why those risks put most people off from cycling. 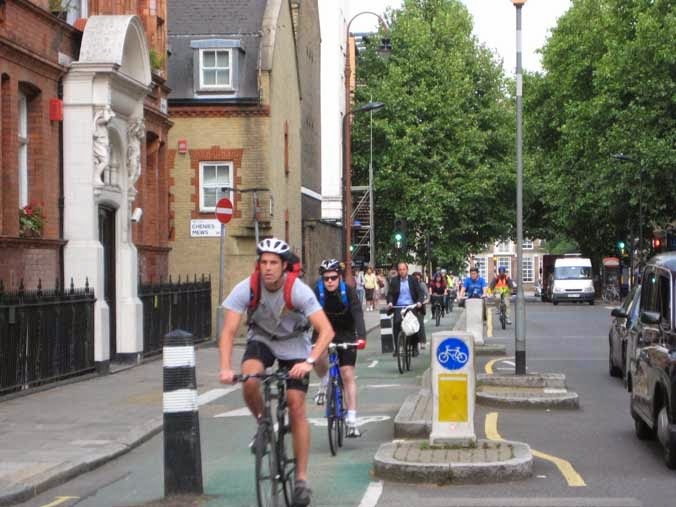 Their systematic quality means that you can minimise them, as the statistics show most people who cycle in Brent minimising them, by diligence, alertness, tactics and behaviours designed and learned to diminish risk in an active, constant, dynamic manner. This is a two-edged sword, however. 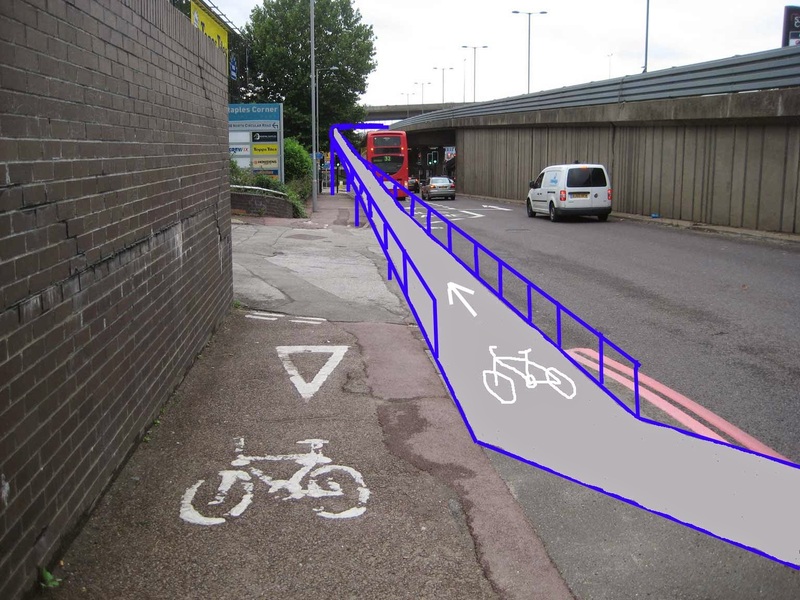 It creates statistical safety, but the fact it has to be done erects a giant behavioural and mental barrier to cycling that the vast majority of the people in Brent are not willing to scale most of the time (Brent's modal share for cycling is between 1 and 2%). Willesden Sports Centre contains travel advice printed on the foyer wall in big letters, telling users, amongst other things, what a good idea it is to cycle there, for all sorts of reasons. But even given the fit and healthy population who will be frequenting the centre, a small minority do so. The centre boasts about 20 bike stands, and a car park that will contain hundreds of cars. Donnington Road, the road giving access to the Sports Centre, is a road where the engineers at Brent Council have tried really hard to reduce vehicular speeds and increase road safety. But they've done it in all the wrong ways, and made it a trial to cycle on. You can see that in this Google Streetview image of Donnington Road just approaching the sports centre from the west. 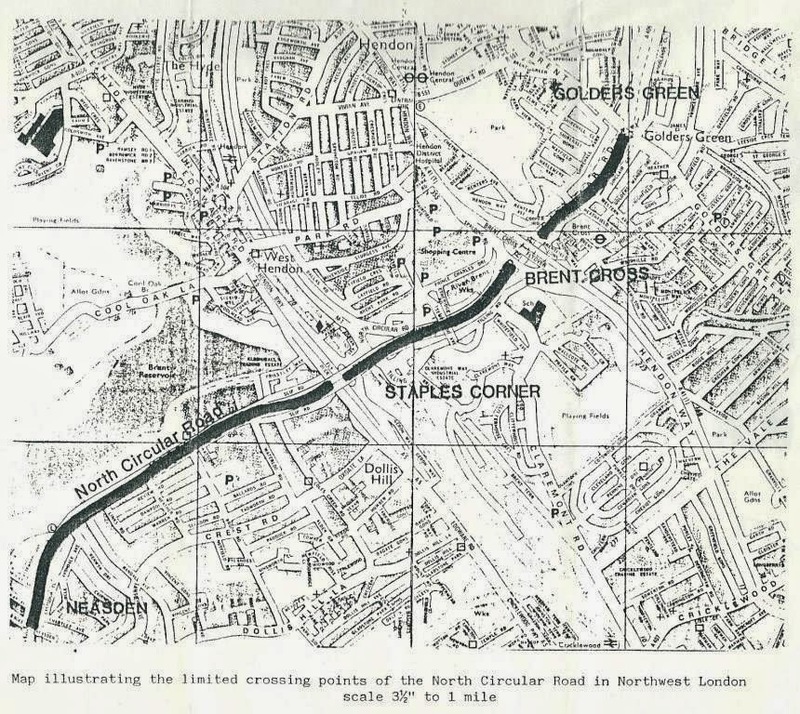 The engineers have radically narrowed the lanes on an already narrow road with frequently-placed islands. 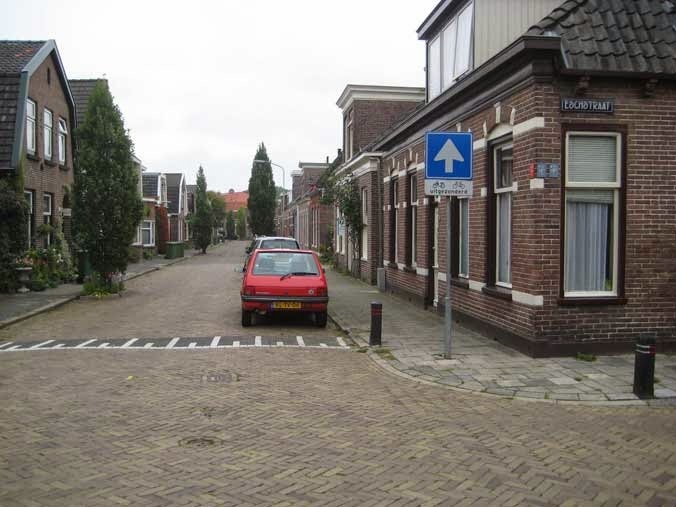 Between the islands, road space is wasted with hatching. They've put speed tables at the islands. What perhaps you cannot see in this picture is that there is a significant uphill gradient going east. 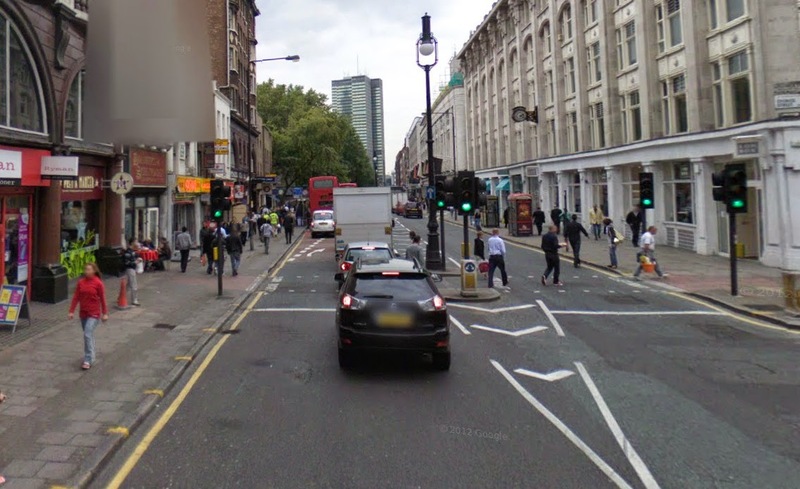 Also you do not see how the road surface has deteriorated at the speed table edges since this view was imaged in July 2012. The problem is that Donnington Road remains a significant motor-traffic through route, as well as giving access to a school and the borough's largest sports centre. 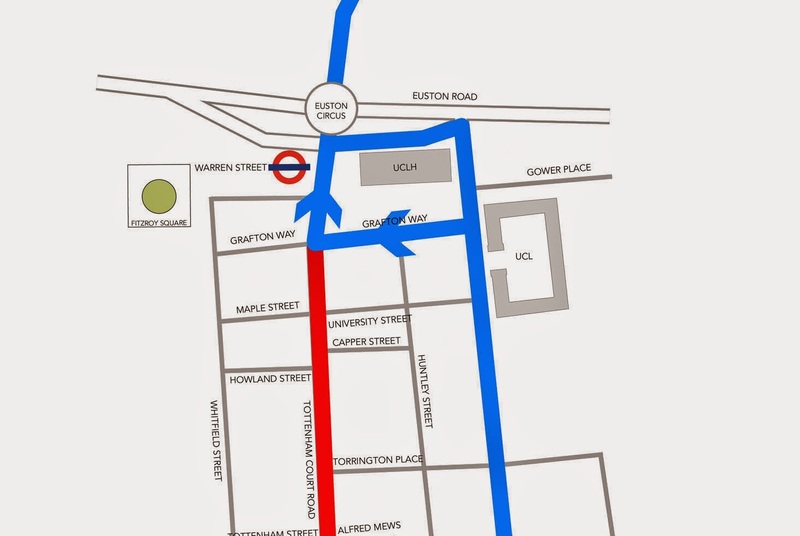 It's a useful cut-through for traffic between Harlesden and the Queens Park and Brondesbury Park area. So there's plenty of traffic, and if you are riding up that road, and riding defensively, or assertively, however you choose to put it, you will be putting yourself in the middle of that narrow lane for a long way, trundling slowly uphill, negotiating the decaying surface and hitting the sharp speed table edges, and choosing to act as a "rolling speed bump", holding up any traffic (including buses) behind you, exactly as Brent's traffic engineers intended. The result is not actually dangerous. It's just not a nice experience. It's the kind of experience that puts people off cycling in Brent. Going back home I use an obscure route via the small pedestrian bridge over the River Brent off Lawrence Way, in Neasden, to avoid the giant gyratory systems in Neasden, that I have described before, and then get into Barnhill Road, and attempt to use the cycle facilities (that I actually originally requested and drew the first design for) between there and Old Church lane, Kingsbury. There's a nice cycle gap through the closure of Barnhill Road (or it would be nice if it wasn't so frequently blocked by the local inconsiderate car parkers), but the crossing on Blackbird Hill, used to reach the cycle contraflow in Old Church Lane, to head towards Kingsbury, is about 50 metres up Blackbird Hill from the Barnhill Road junction. The planners' intention was that cyclists do a left turn at this junction, into the narrow inside traffic lane, on this road full of buses and lorries, then negotiate round any buses stopped at the stop you see in this view, then do a quick left up a short dropped kerb, just beyond the bus stop, on to a stretch of pavement designated "shared use", to do a "jug handle" manoeuvre to aim for the Toucan crossing, where you press a button, and wait a long time, and have to take care to avoid conflicting pedestrian flows. This is all totally standard stuff, straight out of the Department for Transport's best cycle infrastructure advice, as in Local Transport Note 2/08. 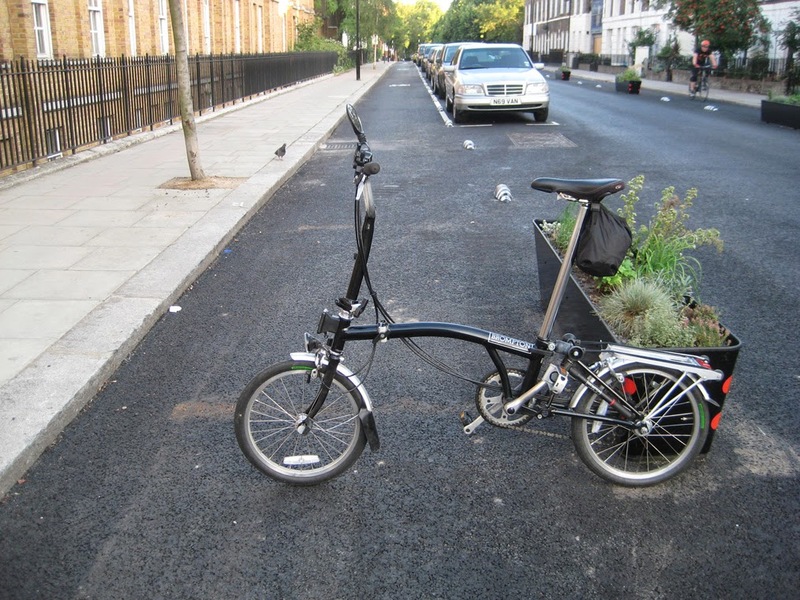 But in terms of convenience and effectiveness for cycling, it is all Professor Brainstawm amateurishness in design in action. 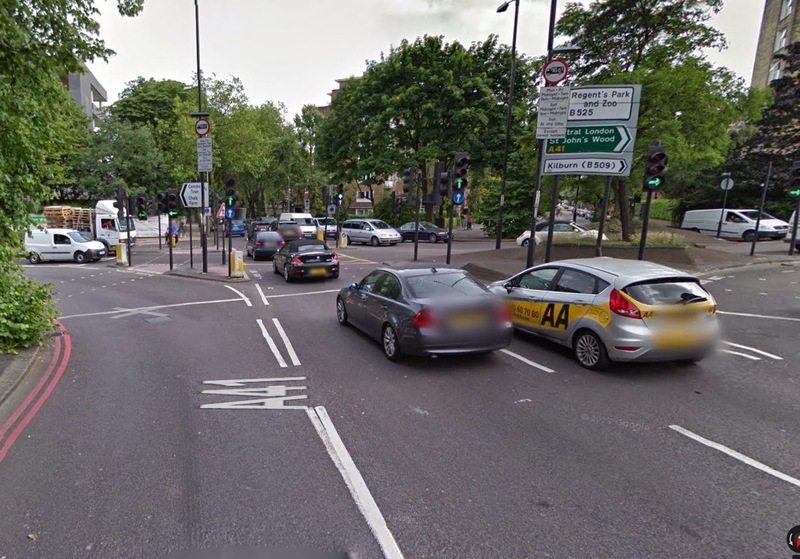 It is an unacceptable risk to ask cyclists to take to join a hugely congested, fast road, with absolutely no space to cycle in, joisting with huge lorries, only for a few metres, before asking them to dive onto a pavement and shared crossing and asking them to play nice with children and parents and small dogs while performing a 270 degree turn on a sixpence. The result will be cyclists cycling on the pavement, and behind the bus stop that you can see, annoying people waiting at the stop. Or it will be people who don't want to risk their lives, or risk being a nuisance to pedestrians, and getting hated, just not cycling. If you have to keep walking stretches with your bike, that's not cycling. You might as well choose another method of transport. On this occasion, as I did this manoeuvre, as required by the design, as safely as I could, trying to avoid conflict with people at the bus stop, I got honked by the driver of a police car, not apparently on an emergency call, who didn't want to let me on to the road. 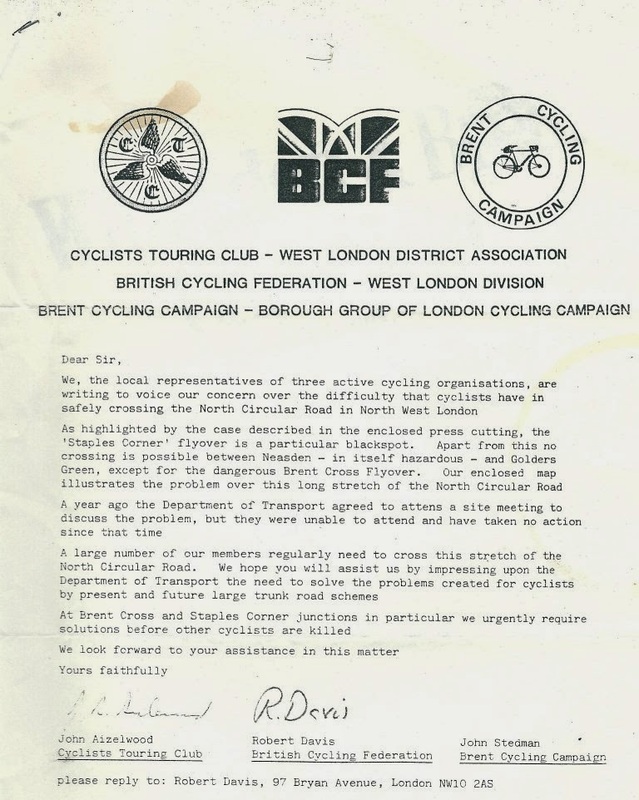 "Why bother to try to cycle legally?" I asked myself. This place could have been so much better, if there was integration between transport planning, and building planning, in Brent. Since this image was taken, Lidl have rebuilt their car park, at a higher level. They would have needed permission for this; it was major work. 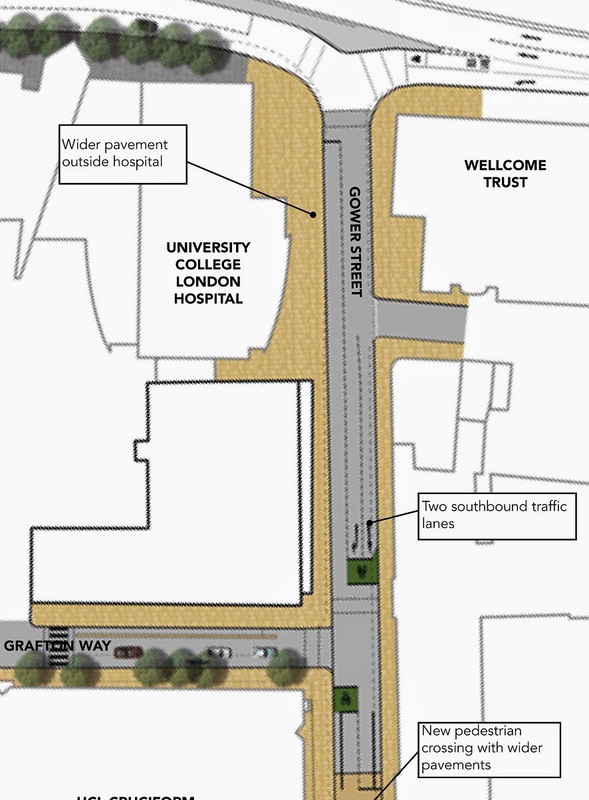 This planning permission should have been linked to a compulsory public land-take alongside this pavement; just 4 metres would have been enough, enough to build a cycle track between Barnhill Road and the crossing and put the bus stop on an island between the track and the road. This was a known issue. 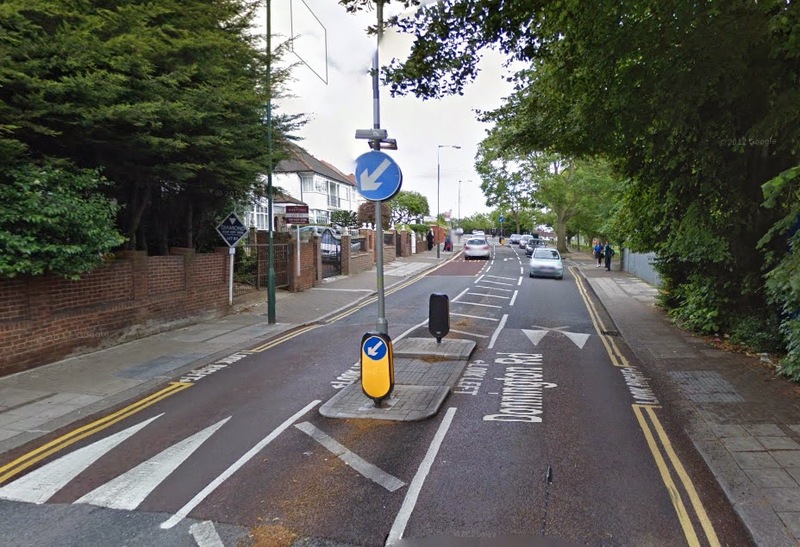 It is a pinch-point that has been flagged-up in (forgotten) Brent cycle network consultation exercises and rides that i have taken part in. It would not have soleve all the cycling problems in Blackbird Hill, but it would have been a big step forwards. 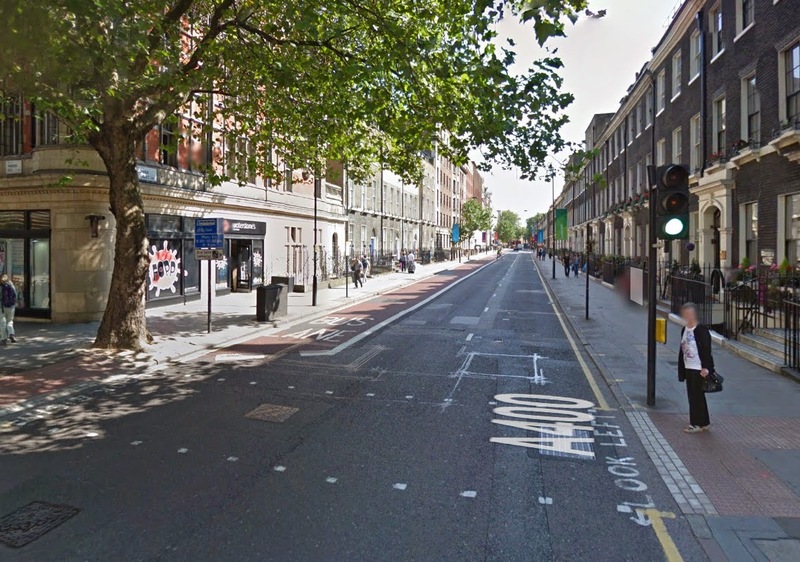 But this sort of joined-up planning just does not exist in London's local government. 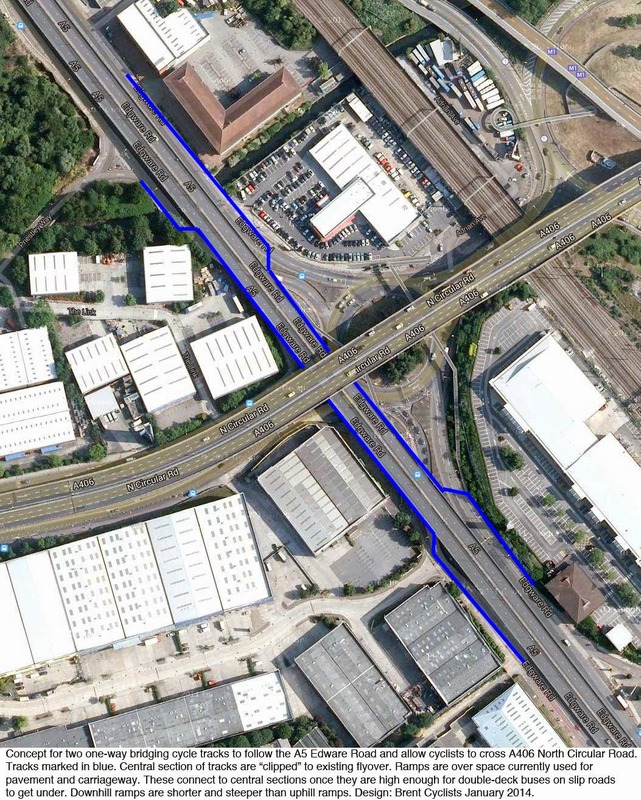 So the problem was not solved, and now, with the construction of a sort of castle wall around the car park, it is likely never to be solved, short of reducing Blackbird Hill from three lanes to two, which seems very unlikely. 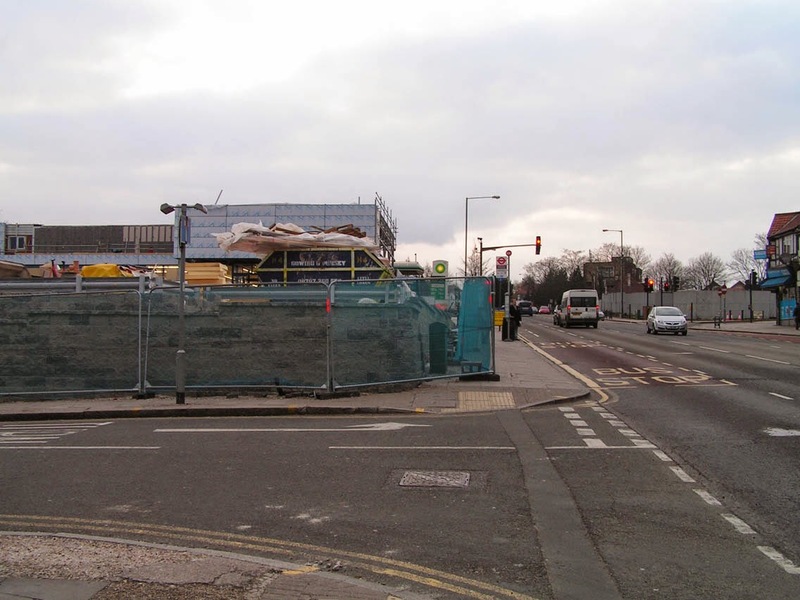 The "castle wall" being built around the new, high-level Lidl car park last year, making the problem of lack of space for cycling on this critical corner even more permanent. It's not the statistical danger of cycling in Brent that causes it to be such an unpopular activity. It's the feel of it – the feeling that you are always in the way, doing something strange, something not properly accommodated by planning, something not really understood by anyone else on the roads. Waiting at bus stops is at least as dangerous, but doesn't have these characteristics. 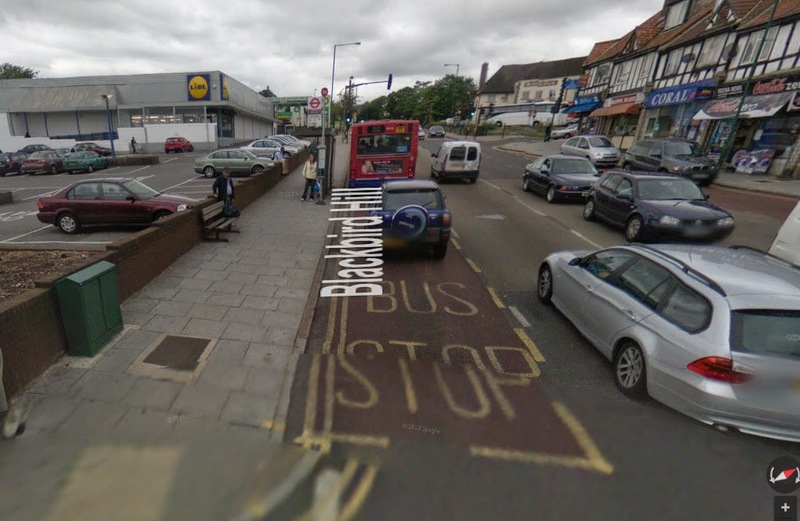 And, of course, the old and vulnerable wait at bus stops in Brent, they don't cycle. As I pointed out before, that skews the statistical risks. The risks of cycling are minimised by the fact the activity is done by the people with the fitness, skills, alertness and agility to minimise them. They don't reflect true environmental safety; far from it. Cycling here is done by the sort of people who go to sports centres, or, actually, by a small sub-set of those people. In the Netherlands it is done by everyone. Another man at the activity I go to at the sports centre told me that, to get fitter, he was thinking of starting cycling there. I told him that, in all honesty, I could not recommend it.